Future Free Facebook Calls : Texas Tim Potter Expat Blog. Facebook, that company that is constantly trying to confuse you by naming its own branded apps after system apps, may launch another app it would now like to confuse you with, and it's called - wait for it - Phone. At least, that's what screenshots from a couple of folks who tipped us seem to say. Facebook, as we know, generally does major interface updates to its application server-side, so users occasionally get seemingly random glimpses of new features or UI designs before they launch. The [FB-ONLY] tag on this button for Phone would seem to indicate somebody flipped the wrong switch, and this element went live before it was supposed to. Tapping the button to install or update it does nothing but throw you to a "no page found" error, which is probably because the application is stored internally on Facebook's intranet for security purposes. What we can divine from this button is, well, not a huge amount - but then again, it does just seem to be a dialer replacement. Phone will block calls from commonly blocked numbers and show you detailed information about incoming calls, a lot like the Whitepages Caller ID app. 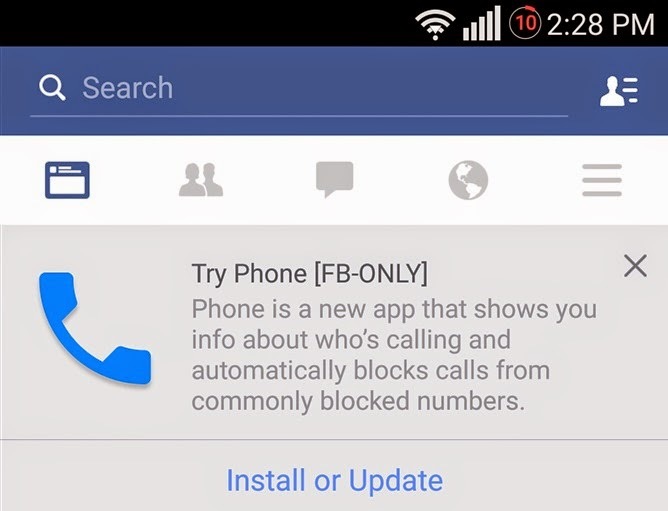 Presumably, Facebook will also be anonymizing your incoming call data for marketing and research purposes, because why else would they want to release an app like this? We don't know if or when Phone will come to exist as a thing publicly, but it does seem like Facebook is at least testing it.